The Tu-134 crash near Petrozavodsk in north-west Russia is likely to have been the result of human error, aviation experts believe. The recovered flight recorders should help determine the exact cause of the tragedy, which claimed 44 lives. ­According to airport officials, the plane was flying off-course by about 200 meters and started its descent much earlier than appropriate. Petrozavodsk ground control says they recommended that the pilots take a second approach because of low visibility and bad weather conditions. The pilot, according to the official, replied that he would attempt the first approach and said he could do it. The blackout on the runway is suspected to be one of the main factors that led to the accident. As the plane came down it damaged high-voltage power lines, which caused a blackout in the airport and the surrounding area. A criminal case and investigation have been opened. “At the moment we are inspecting the site of the crash. 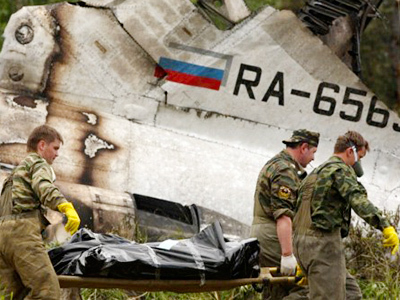 Fragments of the plane are being found in a 300-meter-wide area. We’ve found and retrieved flight recorders. We’ve taken records of communication between the crew and the ground services from the airport. We’ve also retrieved documents and fuel samples from Domodedovo Airport in Moscow,” a spokesman for Russia’s Investigative Committee Vladimir Markin said. A preliminary report by the Russian aviation regulator states that the Tupolev aircraft was damaged after hitting the ground and did not break into pieces in the air, as would be the case if an explosion had occurred on board. 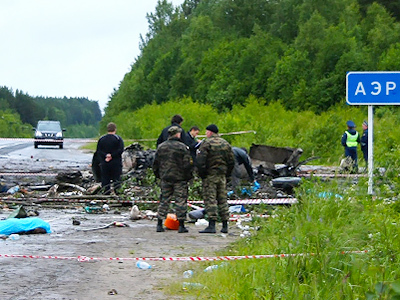 Human error seems to be the most probable cause of the tragedy, First Deputy Prime Minister Sergey Ivanov said. “I don’t want to jump to conclusions, but the most apparent evidence points to an obvious thing – piloting error in bad weather conditions. He missed the runway… Unfortunately it reminds of the recent air crash near Smolensk [where Polish President Lech Kaczynski and many officials died],” the Russian official said. President Dmitry Medvedev has expressed his condolences to the victims’ relatives and ordered Russian transport minister Igor Levitin to investigate the causes of the crash at the scene. The transport minister has already arrived at the site. All RusAir flights have been suspended until the end of the investigation. 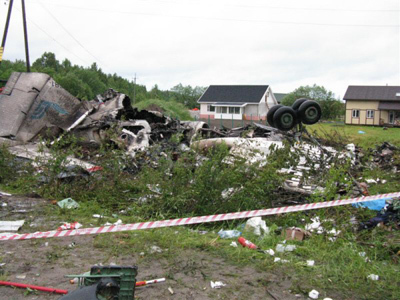 ­Bad weather conditions and pilot error are the two most evident possibilities as to why the Tupolev Tu-134 passenger aircraft crashed in Karelia, believes aviation analyst Chris Yates. “It is always dangerous making a landing or in the taking off. There are loads of things to do and it just takes one simple mistake to turn what could be a routine landing into something that could potentially be so much worse,” Yates added. At the same time, one should be very cautious placing all the blame on the pilots, Yates cautioned. ­Magomed Tolboev, a former test pilot and Hero of Russia, believes Tu-134 planes are reliable. “I don't think anything would go wrong with the plane itself. In 40 years of operation the Tupolev Tu-134 has proved an extremely reliable aircraft. In previous catastrophes, human error was always to blame – and the same is true here. The pilot should have made a second landing approach. This is exactly what happened to the Polish presidential airplane,” he told RT. Russian space and aviation expert, Yury Karash, who is also a pilot, told RT that poor crew training could be at the root of the tragedy. “There are different airlines like Aeroflot, Transaero, which are very big and well-established. But there are also regional airlines which sometimes consist of just two or three aircraft. And God knows how well they are technically maintained and how well their crews are trained,” he said. ­A former American Airlines pilot, Captain Mark Weiss, says a major question that needs answering, is whether the aging plane had the necessary warning equipment. "Certainly one of the things we have to find out was whether this aircraft did, in fact, have onboard a ground proximity warning which would alert the pilot that it is closer to the ground, or that his distance from the ground was either too close or too fast for the appropriate position on the phase of flight," he said, "That is, the landing phase of flight – it would say terrain, terrain, terrain, too low – pull up – various types of warning systems like that are on aircraft." ­The RusAir airline reported that the Tu-134 was in good technical condition before it took off from Moscow. The aircraft substituted a Bombardier CRJ-200, which previously did the Moscow-Petrozavodsk flights. However, since June 17, the operator of the Bombardier, RusLine airline, handed over the route to RusAir, since their larger Tupolev could handle the increased summer traffic. The Tupolev Tu-134 is a twin-engine airliner designed in the early 1960s in the USSR. The model has been in operation in more than 40 countries, but the largest fleet of Tu-134s is still in Russia. The aircraft which crashed early on Tuesday was commissioned in 1980. In 2007, the Russian transport minister, Igor Levitin, called the Tu-134 an old and outdated airliner that needed to be replaced by the Sukhoi Superjet 100 or foreign equivalents within five years. There are 28 recorded crashes, including this latest one, for this model.